When dropshipping, a vendor will often send tracking information in a file. SellerCloud provides a template which can be used to import the tracking, provided that the vendor is willing to use that format. The tracking will import on the the customer order, not the PO that was auto generated by the dropshipped request, and will be uploaded to the order source with the next automatic feed. This import does not support multi-package orders. Tracking numbers can be updated to multiple packages on the SellerCloud interface. On the order, select Ship Items from Action Menu, then place the tracking number on each package and ship. 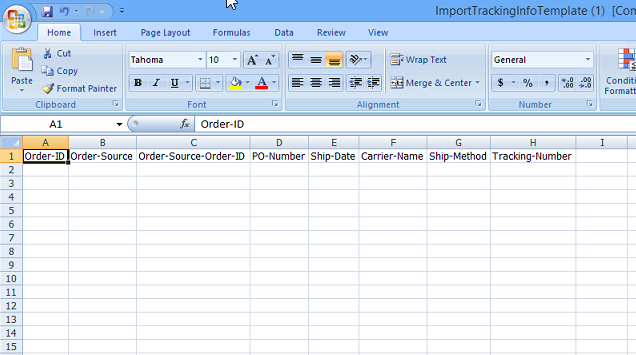 Under Orders > Import Tracking Info > Select a format type > Download the sample template. If OrderID is provided, then there is no need for OrderSource or OrderSourceOrderID or PO#. If PO# is provided, then OrderID, OrderSource or OrderSourceOrderID aren't needed. If both OrderID and PO# are not available, then you will need both OrderSource and OrderSourceOrderID. Important Note: All column headers must be in the file whether or not the column is populated by any data. The Shipping Cost can be entered to make sure the P&L is correct on the order. Warehouse Name can be entered to change the ShipFromWarehouse on the order, which determines which warehouse inventory is deducted from. If the vendor has a different format, contact SellerCloud Support to create a custom Import Tracking Plugin. Settings > Toolbox >Scheduled Tasks. If using a custom plugin, select it from drop-down.